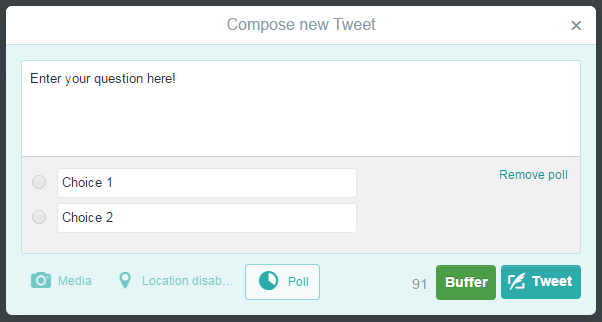 A Twitter poll takes up some of your 140 character limit. Just like an image or a link, Polls take up 24 characters in your message. That means Twitter Polls leave you with 116 characters to ask your question and include whatever else you need (such as hashtags and @ mentions). The two choices for response also have a character limit. Just 20 characters are available for viewer response in the poll. This may mean you have to rephrase your response options to keep it short, sweet, and easy to understand. Polls on Twitter only live for 24 hours. During that time, anyone can weigh in on your question. After 24 hours, users can no longer offer their input and the poll is locked with just the results showing. Keep this time limit in mind and make sure you post your questions on a day and time that gives people the best opportunity to respond. Just because polls are open for 24 hours doesn’t negate the fact that most tweets have an average half-life of just 24 minutes. Post at your prime times for response to gather the most replies within the life of your message. As with most engagements, you’re likely to see the majority when the message is initially posted, with stragglers coming in over the next 24 hours. People love to be part of something big. Twitter Polls display the number of votes collected at the bottom of the poll. Those with higher vote counts are likely to attract more voters as everyone wants to weigh in on hot questions. This is another reason that posting at your prime times will help you see the greatest success, as high response right away will lead to others seeing greater value in responding to questions that have gathered lots of response. Twitter Polls are limited to 2 choice responses. Just A or B, option 1 or option 2. While there’s a ton of insight you can gather with just 2 choices, it can also be a bit limiting. Multiple choice isn’t an option at this time, so pick your choices wisely. Consider your audience when choosing your options. Will they respond best to simple ‘Yes’ and ‘No’ choices? Or will they engage better with something a bit more tailored for them, like “F*ck yeah!’ and “Hell no!’? The answers you choose can have a big impact on the viewers engagement with your poll, so put some thought into them. Twitter Polls do not allow you to attach an image or video to go along with it. While this means you can’t ask questions about a picture attached to your poll, you could include a link in the message and ask people for their thoughts on what they find in the link. This can be a great way to drive people to your site and then get their feedback on what they see or read immediately. You can post a link in the choices but they must still be under the 20 character limit. This means even bit.ly links are too long (they’re 21 characters). The links aren’t clickable and there’s very low chance people will take the time to copy and paste them into their browser. For these reasons, it’s best not to include a link as a poll choice. Even though links in your poll choices are unlikely to produce good results, you can certainly give them a shot. If you believe you have a very engaged audience, you may be able to get them to do the copy and paste to vote in your polls. Simply take a shortened bit.ly link and include it in the poll choices without the http:// at the start and you’ll be under character count. Make sure you make it clear voters will need to go and look at the links before voting. All polling results are public. Anyone that votes for a poll can see the results. This will help encourage people to vote so they can see the outcome. It also means your competition will be able to see it too. Keep the public results in mind when asking questions that may give your competitors valuable information about your following. Polls give you insight into your audience but also give them the same. While they may be a great way to find out more about your customers and learn to better serve them, always remember that you should never ask a question you wouldn’t be happy to share the answer to with others, including the competition. You can respond to any tweet with a poll. This is a great opportunity easily gather someones opinion and create an easy engagement opportunity. While responding with a poll does make for an easy response from those you replied to, it also limits the engagement to a simple A or B rather than a more engaged answer. Consider this when thinking about using polls in your responses. The addition of Twitter Polls is an awesome way to engage our audiences in a fun, new, and easy way. While the concept is simple, those that consider the options, limitations, and best uses will see the greatest response and gain the most insights. 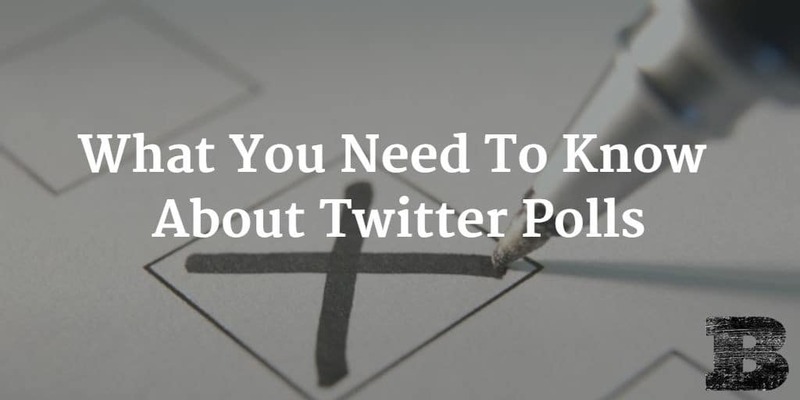 Start thinking about how you can use Twitter Polls to engage your following and explore opportunities to gather greater knowledge of your network now.